Israelis hoisted an ISIS-inspired black and white flag in an anti-African march in Tel Aviv today, to protest a recent court ruling that rendered illegal a desert detention facility where African asylum seekers are being held without charge. The ISIS-style flags waved have the Hebrew word “bagatz,” meaning “High Court,” across the banners. Some of the marchers are holding them in tandem with Israeli flags, but others hold the handmade ISIS-style drapes alone. Simone Wilson, the Jewish Journal‘s foreign correspondent in Israel, is covering the protest now in south Tel Aviv in an African refugee neighborhood where Israeli youngsters have taken over the streets and attempted to break into African-owned businesses. 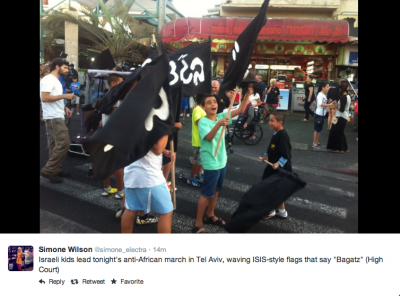 She is live-tweeting the protest and captured the backers of the ISIS aesthetic: a soldier in uniform, settler leader Baruch Marzel, and Mai Golan, the anti-African darling of Israel’s right-wing who soared to fame two summers ago when she declared in a similar march, “I am a proud racist,” and shortly after took a position in the city government.